rafting a well-formatted screenplay has strict rules that every student of screenwriting must learn. From Robert McKee to Save the Cat!, writers have many resources for making script formats more dynamic and marketable, except when it comes to the modern Hollywood musicals. 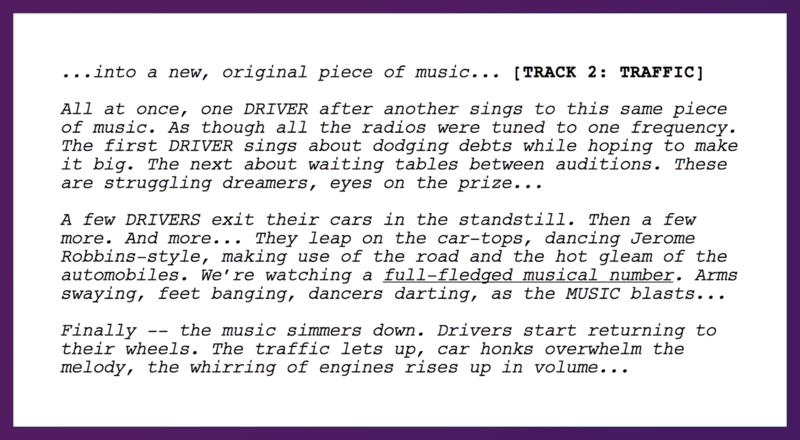 There’s a lot of mystery around the dos and donts of writing a musical screenplay. Today, we’ll be taking a look at the La La Land script and analyze how to break tried-and-true screenwriting rules to tell a modern musical story. In 2016, no one could have predicted that an independent, modern-day, Hollywood musical would receive 14 Academy Award nominations. La La Land did just that. In fact, La La Land just narrowly lost the best picture Oscar for the year. It did win Best Screenplay for writer-director Damien Chazelle. 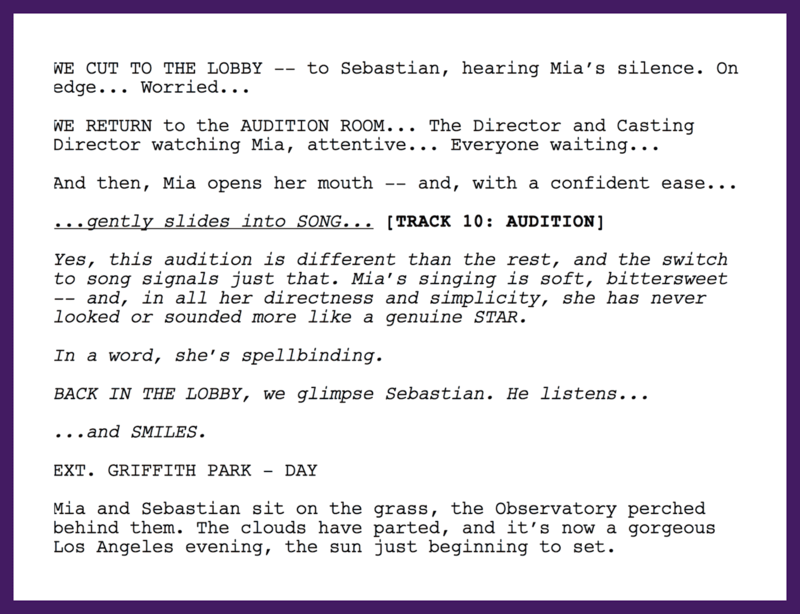 In this La La Land analysis, we'll highlight the formatting and structure of a movie musical script. The specific story structure and script formatting that Chazelle used for the La La Land script is a bit unorthodox. This is because Chazelle knew that he'd be attached to direct and would have the final say in production. In many ways, he wrote the script for himself as the director which means there are many directing call outs you wouldn't normally see in a musical script. Unless you're attached as the director of your script, take Chazelle's formatting with a grain of salt, especially if your goal is to sell your script or concept. With that said, you can still learn a lot from the formatting in La La Land. We'll cover the rules you should know (and how Chazelle breaks them). While we’re at it, we’ll go over the rules that you generally should avoid breaking unless you’ve already got the greenlight as a writer-director. Remember: imitation is flattery, but originality wins Oscars. Here is our La La Land Script Analysis. The La La Land plot synopsis is musical set in four “seasonal” acts and follows a classic formula. It's the story of a boy and a girl who meet and fall in love in the city of Los Angeles. He is a musician. She is an actress. But their passion for their individual dreams derail their passion for each other. La La Land is a film musical that upends the genre in its scope and structure. But, it starts with the very format of the script. After two near misses, Mia and Sebastian meet cute at a party in Los Angeles and fall in love while chasing their dreams. Their dreams further diverge as Mia considers giving up on acting aspirations, while Sebastian debates "selling out" his Jazz dreams for a more stable job. They have a major argument over dinner and go their separate ways. They take their separate paths. Sebastian opens a successful club, and Mia gets the role that makes her a star. The scene of what could have been is bitter-sweet as they both have achieved their dreams, but lost their relationship in the process. In the golden, “olden” days of the Hollywood movie musicals there was a standard approach to scripting lyrics. Spell out (and space out) the lyrics in the action line or dialogue. Story-wise, it helps the reader understand the context of what's happening. Logistically, it fills in a page to more accurately reflect the standard 1 page = 1 min of screentime rule. Surprisingly, one of the most telling differences in La La Land is that the lyrics are not featured anywhere in the action or dialogue! "Mia begins to speak/sing about her aunt's trip to Paris." The lack of lyrics would have given Chicago's Kander and Ebb an angina. So we know that Chazelle doesn't spell out his lyrics in action or dialogue (though it's best practice to do so). Now, you might be thinking this would totally skew the 1 page : 1 min ratio, and you'd be correct. But Chazelle makes up for the missing page lengths with something else: extensive descriptions of choreography. Why Chazelle spells out the dancing but not the lyrics is a matter of debate. But logistically speaking, the extended action descriptions allow the pages to be spaced out, and more accurately reflect 1 page : 1 min ratio. In any event, the academy was impressed enough to give Chazelle Best Screenplay. Diegetic Sound and Non-diegetic Sound. Diegetic sound is any element of the films sound that is sourced within the actual scene rather than outside the context of the film's narrative. Non-diegetic sound is any sound that the viewing audience can hear but the characters in the scene cannot. Non-Diegetic Sound examples in film: Underscoring such a the famous score from the shower scene of Hitchcock’s Psycho. 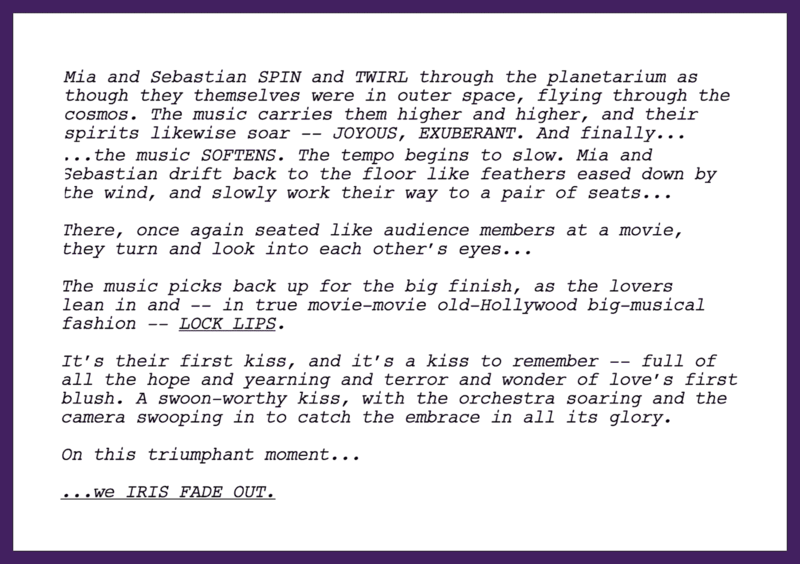 For example, in the La La Land script's Planetarium scene (see above), Chazelle describes the underscoring in the action line. A film's score, referred to as non-diegetic, is rarely ever mentioned in a screenplay, no less a musical sequence. In this case, the underscoring is such an integral part of the scene that we can make the case that it's important for characters to react to it, but Chazelle constantly references the underscoring throughout the La La Land screenplay. Generally, writing out non-diagetic sounds or underscoring is seen as a no-no. But in this case, it works. Another way that Chazelle’s La La Land script breaks with traditional formatting is in his fantasy/dance sequences. Usually fantasy sequences are formatted with a simple heading such as "Fantasy Sequence." But the La La Land script identifies fantastical elements in italics. It's defined early on as a sort of motif throughout the script. A cue for the reader that we have entered a dance sequence or fantastical dimension. Another way that the La La Land screenplay is unique is in the way Chazelle reveals plot and emotions. He often fills his action lines with internal thoughts and revelations. This would drive most screenwriting teachers up the wall. As a student writer I was instructed if one cannot see it on the screen, it should not be included on the screenplay. "Sebastian is momentarily at a loss for words -- and even a little surprised. Wasn't expecting such a thorough put-down." How do you visualize that last bolded part? Typically this part of description would be excluded from the script. "Mia glares at him, satisfied with herself. Sebastian knows he needs to deliver a stinging comeback, searching for the right one--"
Again, the bolded descriptions of thoughts and inner states are often avoided. Though Chazelle isn’t the first writer to “tell not show," it's not a best practice. Of course, the words are not going to literally cut her. These kinds of descriptions are best left out. Download your FREE La La Land script (PDF). Just enter your email address and we'll instantly send it to you! We hope you enjoyed our La La Land script analysis. A wise woman once said, “In order to break the rules you first have to know them!” Damien Chazelle proves this. While the screenplay is an homage to the heyday of the Hollywood musical, his formatting is anything but. It may not be the norm, but, hey, there more than one way to skin a cat! Speaking of unconventional formatting (or skinning), who better to study next than Quentin Tarantino? As a next step, check out our script analysis of Pulp Fiction, where we break down how to structure complex non-linear timelines, crafty dialogue, and a strong writerly voice. Plus we provide a free Pulp Fiction script PDF you can download and reference.